At the recently concluded global trade summit Vibrant Gujarat, Africa Day pinned the business ties India and Africa can have while also throwing light on some of the recent developments between the two lands. It was the first time that a day had been dedicated to an entire continent at Vibrant Gujarat, clearly indicating the importance being attached to the continent and its economy. In March 2018, African continental free trade agreement was signed in March showing the interest India has in working with the continent, and the Africa Day furthered the trade conversations between India and the continent of Africa. 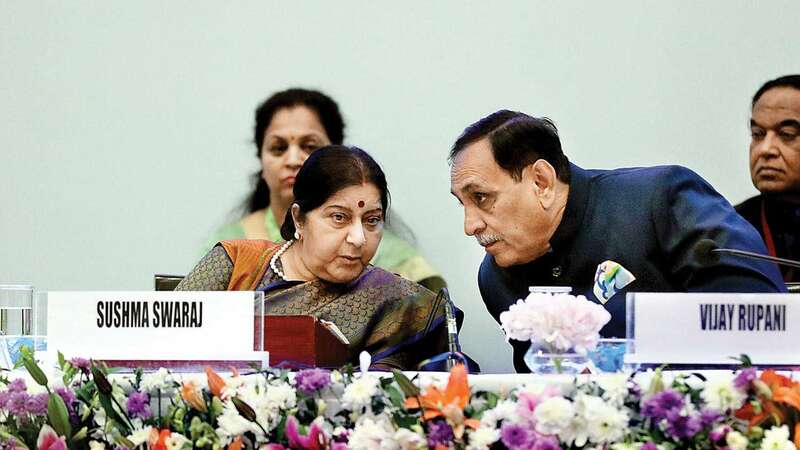 “We are determined to anchor our partnership on the principles of equality, mutual respect and mutual benefit, Sushma Swaraj, the external affairs minister of India, said at the event, remembering how external help came with conditionality and the threat to sovereignty when India had gained independence. “We take pride in our model of cooperation with Africa which is demand driven, consultative, participative, involves local resources, builds capacity and is based on Africa’s own prioritisation of its needs,” she said. Africa has emerged as an important trade and investment partner for India. India-Africa bilateral trade stood at USD 62.66 billion for 2017-2018, reflecting an increase of nearly 22 pc over the previous year. India is the third largest export destination in Africa; and the Duty Free Tariff Preference Scheme (DFTP), announced by India for least developed countries, has benefitted 38 African nations. “The recent signing of the African Continental Free Trade Area, is yet another opportunity that woos trade and economic ties with Africa, with the positive effects of democratic dividend and the African continent has become one of the fastest growing regions in the world,” Swaraj noted. India is the fifth largest investor in Africa with community investments of 54 billion dollars with Indians investing in telecommunication, hydrocarbon, exploration, education, petroleum refining, retail, pharmaceuticals, automobiles, minerals, infra, information technology among other sectors. “Currently, 189 projects in 42 African countries, for nearly 11.4 billion USD are being implemented under Indian embassies,” Swaraj said. Gujarat has a long coastline with close proximity to African coast, which attracted Gujaratis to migrate to Africa centuries ago, noted Gujarat’s chief minister Vijay Rupani adding that 50 countries out of the 54 African nations are participating in the event, demonstrating their interest in working with India, yet again. “The opportunities are enormous. There is no better place to do business than Africa. We are ready to do business with Indians,” Okello said. “We have stories and stories of Indians who came as small businessmen and now are huge industrialists,” he added. Namibia, Africa’s second youngest nation, too marked its presence at the event by highlighting its exports, which include diamonds, copper, gold, lead, uranium, lithium, iron and also some foods. “We are blessed by a huge geographic area in terms of natural resources and we are the fifth largest uranium producing country in the world. We are also the 12th largest diamond producer in the world,” Tjekero Tweya, a Namibian politician and trade unionist said. “Our minerals are ready for exploration,” he added. Tweya also highlighted exploration opportunities in its off shore gas fields and oil and how the countries developed infrastructure such as roads and ports will bring ease in doing trade. Presidents of Angola and Nigeria have embarked on a reform agenda to strengthen a regulatory framework for key business in their countries. “Conducive business environment and predictable framework conditions are required to make the investors feel that their investments are safe. African countries realise this and many have been taking the lead in providing favourable business environments to both domestic as well as foreign companies,” said Neena Malhotra, joint secretary, east and southern Africa. “In agriculture and agro processing sectors, India has a unique opportunity, which can be leveraged through public-private-partnerships. The surge of the service trade in Africa offers a new opportunity for Indian companies, especially in the area of education, IT, telecommunication, tourism and entertainment,” he added. For businesses in India as well as Africa, the government of India’s line of credit is also available. “The portfolio for Africa is particularly large, closing in on USD 10 billion at the moment, and this covers a range of sectors and projects,” said David Rasquinha, managing director, Export-Import Bank of India, adding that the assistance will be available for industries that are Africa’s development priorities.